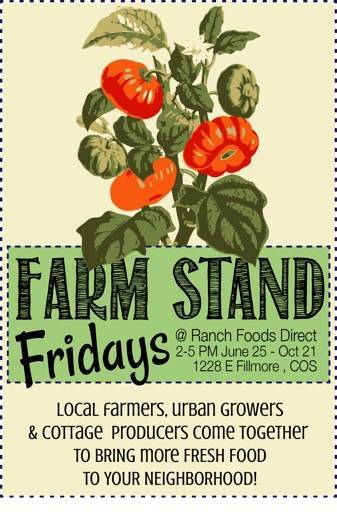 Introducing Farm Stand Fridays at RFD! Preview event being held this afternoon. The Ranch Foods Direct store at 1228 E. Fillmore is calling it a “soft opening…” but several of the store’s favorite vendors will be setting up tents or displays in front of and around the building today from 2-5 p.m. Come by and get a preview of RFD’s new “Farm Stand Friday” concept with guests to include local favorite Azteca Gourmet Tamales! Lorena uses only the best – including Ranch Foods Direct meats – in her handmade tamales! Also expect to find some tasty fresh produce… with more to come as the season gets into high gear. Know your food, know your farmer… with this handy store-side farmers market… Meet in person some of the store’s favorite suppliers, while you shop for high quality, humanely raised meats, specialty Colorado Proud products AND great gifts for Father’s Day and other special occasions!